Do you freeze at the thought of making a sales call? Do you feel guilty asking businesses to invest in your products? Does a negative conversation send you into a self-destructive madness? If you answered ‘yes’ to any of these questions… Or you have answered ‘yes’ to any of these questions in the past, this blog post is perfect for you. As a consumer, we cringe at the thought of getting a sales call. Precious minutes of our life, completely wasted. But, as a business owner or a sales manager, we need them to keep our business alive. Therein lies the dichotomy… Consumers vs. Business. You are a consumer talking to another consumer. Remember our blog post “The Anatomy of Emotional Marketing“? We review the concept of H2H, a different approach to marketing which features humans talking to humans. The same applies to sales. For the purpose of this blog, I am going to eliminate the word ‘sales’ from ‘sales calls’. This is a part of a larger process of eliminating our ‘sales’ perspective from sales calls. These tips will help you move from a sales Padawan to a sales Jedi, in no time. So what is a salesperson? So, you’re a problem solver. You aren’t a shark. You aren’t a greedy employee who wants more commission. You aren’t a salesperson. You are trusted to make calls to potential customers in an effort to make them believe in your product or service. That’s a blessing, not a burden. What you must be able to answer prior to dialing anyone‘s number is: why do you believe in your company? Once you can answer this question, you will be able to say, without any doubts, why customers should choose to purchase with you, as opposed to Billy Joe Bob’s company. I would go so far as to suggest that you write down your answer to the aforementioned question and place it in an obvious place. Look at this answer before every phone call. When you believe in yourself, people tend to believe in you, too. Establish a professional greeting. I strongly suggest avoiding all slang when calling a potential customer. Here’s a slang example: “What’s up dude? It’s Parris from Trade Only.” This will most likely prevent a closed deal, as well as any potential deals in the future. We do suggest, however, to establish a professional greeting such as: “How do you do Joe? My name is Parris Wells, and I am the Digital Marketing Manager at Trade Only.” See the difference? Night and day. Determine your purpose for making these calls. This should be a general idea rather than a word-for-word script. Why are you making these sales calls? What product or feature are you trying to promote? Or, are you just trying to establish contact with a particular list of people? Determine what it is you want from these phone calls, and keep this in mind when you dial. Set daily goals. It is much easier to find motivation with a particular activity when you have a goal in mind. Set your goals for the day; what do you want to achieve? How many calls do you want to make? How many meetings do you want to schedule for the following week? Once you have goals, your vision becomes more clear. Also, studies show that writing down your goals heightens your chances of actually achieving said goals. Avoid expectations. Setting goals and setting expectations are two completely different things. One is productive, and the other is the root of all heartache. Do not set expectations for your phone calls. Keep an open mind, and the people on the other line will appreciate your patience. Create a database of questions. Be prepared with questions before you even pick up the phone. You may not even look at this database if the conversation immediately takes off. But, there is nothing worse than dead silence on the phone *cringe*. Be ready to fire some of these questions if your conversation is rather dull, and get a discussion started. If, however, you get feedback from your sales lead, make sure you use questions that build off of what they’ve told you. Focus on THEM not YOURSELF. The last thing you want to do when you’re on the phone with a potential customer is go on and on about your products and your company. They don’t want to hear that. Everyone loves talking about themselves; always turn the conversation back to them. What do they need? What type of platform will helm them? Ask questions. Not ‘yes’ or ‘no’ questions, but questions that require a detailed response. That’s how you learn what they want to hear. If you have to leave a message, make it exciting. If you get stuck with someone’s voicemail, you must make it one hell of a message if you want a call back. Pull out one of your best statistics, and drop that on the line. Ask them to call you back. Express your excitement. Add some humor… Whatever makes you feel most comfortable. Don’t be afraid to discuss things other than business. Great sales calls are about 25% business and 75% personal. It blows my mind how I can listen to our sales rep Kristen Trotta talk to a potential customer for 30 minutes about family, hobbies, vacation destinations, and more. The result of these sales calls? Sales. Personality always wins. Always end your conversation with a call to action. No matter what, you should end your calls with a call to action. Ask the person on the phone to do something. Whether it be check their inbox for a follow up email or wait on the phone to be transferred to your finance department… Always end with a call to action. Always. As with anything in business, tracking data from your sales calls is crucial. How many calls do you make? What time of day works best? How many referrals do you get? How many meetings do you set up? How long do your conversations last? What questions get the most traction? Which business representative gives you the most traction? I.E. which person should you ask for in the office? Just kill it! 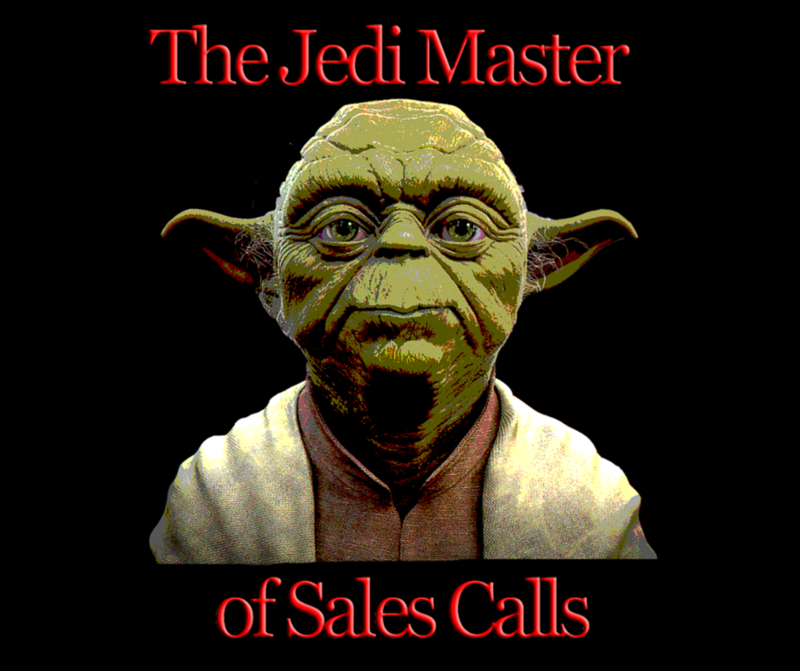 Have fun with your sales calls, and you will soon become the Jedi Master of sales calls. Linda Chaddick on Are you making these 4 email mistakes? Meera Luhar on Are you making these 4 email mistakes? Chris Lee on Are you making these 4 email mistakes?